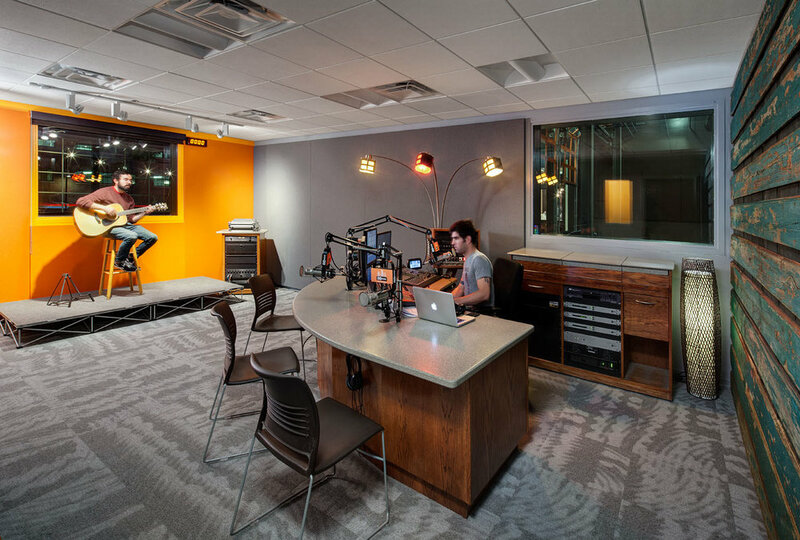 There is a special place in Milwaukee’s heart for 88Nine, a fiercely independent public radio station with strong music programming and a bent toward public service. The station has a robust personal presence in the community as well, inviting its audience to meet and hear visiting artists in tiny venues, and wasting no opportunity to throw a good party. Its new home better enables all of the above, while practicing some solid left-wing sustainability. Starting with a two-story warehouse building, some used shipping pallets doubling as CD racks, and some quintessentially weathered Wisconsin barn boards as low-cost diffusion, the project situates well-isolated imaging and voiceover rooms and administrative space on the second floor, reserving the first floor for a café, the windowed control room, and a 100-seat live room. The live room opens to the lobby through three garage doors that turn the entire first floor into a concert/party venue.